This image made available Wednesday, Dec. 20, 2006 by the Norwegian Coastal Administration, shows part of the wreck of the WWII German submarine U-864 in waters off Norway's coast. The submarine U-864 was torpedoed and sunk by the British submarine Venturer off western Norway on Feb. 9, 1945. EPA / CROWN COPYRIGHT RESERVED / Leading Airwoman Kelly Whybrow . Ship's manager Aaron Washington, left, and Evan Fasillis discuss on-going work being done beneath the World War II submarine USS Pampanito Friday, Jan. 26, 2007, in Alameda, Calif. To spruce up the warship and keep it as a floating tourist attraction at San Francisco's Fisherman's Wharf, the Maritime National Historical Park Association has taken the Pampanito to Bay Ship and Yacht Co., where the 1,500-ton vessel will have its hull power-washed, rust ground down and sections of deteriorated metal replaced. The boat is scheduled to be back in action around Feb. 10. "The goal is to have the Pampanito looking almost exactly as it did in 1945 when it was decommissioned," said Aaron Washington, the boat's manager. Containers float in the water after the roll on/roll off containership 'Republica' capsized during loading in the port of Antwerp, Thursday, March 8, 2007. In this picture issued Wednesday, March 14, 2007 by Britain's Ministry of Defence, a helicopter flies in to rescue Romanian sailors from a cargo ship stranded in as storm south of the Greek island of Carpathos, Wednesday. The St. Vincent and Grenadines-flagged "Afrodite S" was abandoned after its cargo of cement shifted and the listing vessel took on water, the Greek Merchant Marine Ministry said. The cargo ship was carrying bulk cement to Italy from the island of Cyprus. A trident submarine is pictured with a long lens at the Faslane naval base, Scotland, 14 March 2007. Britain's Prime Minister Tony Blair faces Today potentially the biggest rebellion from within his own party since the Iraq war as lawmakers vote on renewing Britain's Trident missile nuclear deterrent. Residents watch from the shore as a military submarine is dragged to its position in Lushun, in Dalian, in northeast China's Liaoning province Tuesday March 20, 2007. Workers use cables to drag a retired military submarine into position in Lushun, in Dalian, in northeast China's Liaoning province Tuesday March 20, 2007. The 76.6-meter-long (255-foot-long) Type 33 submarine was retired last year and will be redecorated before being exhibited at a museum of submarines in Lushun. Two residents talk on the seashore while watching a military submarine being dragged to its position in Lushun, in Dalian, in northeast China's Liaoning province Tuesday March 20, 2007. The 76.6-meter-long (251 foot) Type 33 submarine was retired last year and will be redecorated before being exhibited at a museum of submarines in Lushun. U.S. Coast Guard officers guard 19.4 metric tons of cocaine confiscated from the cargo ship Gatun with destination Mexico, Thursday, March 22, 2007. Panamanian police working together with agents from the U.S. Drug Enforcement Agency (DEA), seized the cocaine shipment, one of the biggest maritime cocaine busts anywhere on record. A Panamanian Anti Drug official guards the dock next to the U.S. Coast Guard ship holding 19.4 metric tons of cocaine confiscated from the cargo ship Gatun in Panama City, Thursday, March 22, 2007. The Gatun, that had Mexico as final destination, was seized Sunday about 30 kms (20 miles) southeast of the island of Coiba. Panamanian police working with agents from the U.S. Drug Enforcement Agency (DEA) seized the cocaine shipment, one of the biggest maritime cocaine busts anywhere on record. In this photo released by the Florida Keys News Bureau, tugboats pull the decommissioned Gen. Hoyt S. Vandenberg through the Berkley Bridge to the Colonna's Shipyard in Norfolk, Va., Friday, March 30, 2007. In this photo, released by the Florida Keys News Bureau, tug boats pull away the decommissioned Gen. Hoyt S. Vandenberg from the James River Naval Reserve fleet at Fort Eustis, Va., Friday, March 30, 2007. The former U.S. Air Force missile tracking ship was towed to a Norfolk, Va., shipyard to be cleansed and prepared to serve as an artificial reef about six miles off Key West, Fla. The vessel, that once tracked Mercury space flights and served as a set in the 1999 move "Virus," is to be scuttled in the spring of 2008 as an attractions for sport divers and anglers. A small Coast Guard patrol boat motors alongside the 71-year old Eagle, a 295-foot Coast Guard sailing vessel, approaching the harbor in San Juan, Puerto Rico, Thursday, May 10, 2007. The only square-rigged sailing ship in United States government service, the vessel was built by the Nazis in 1936, and was taken as a war prize by the United States, who renamed it. Passing the high walls of El Morro fort, the 71-year old Eagle, a 295-foot Coast Guard sailing vessel approaches the harbor, in San Juan, Puerto Rico, Thursday, May 10, 2007. Ships enter the harbour of Hamburg, Germany, on Friday, May 11, 2007 during the grand arrival parade. 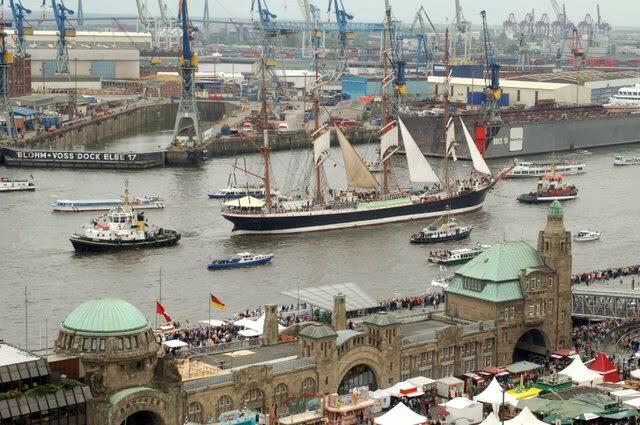 Hamburg celebrates the 818. birthday of the harbour with ship parades, and illuminations during the worlds' largest port celebration. A California Department of Forestry fire truck is unloaded from a Navy LCAC hovercraft at Pebbly Beach heliport near Avalon, Calif., Friday, May 11, 2007, on Catalina Island. Dozens of fire engines from as far away as Fresno arrived through the night aboard giant military hovercraft from the Marine Corps' Camp Pendleton. The high-speed hovercraft can carry 60 tons over land or water and are often used by the military on humanitarian missions. A California Department of Forestry fire truck is unloaded from a US Navy LCAC hovercraft at Pebbly Beach heliport near the city of Avalon Friday, May 11, 2007, on Catalina Island, Calif., to help fight the out of control wildfire on the island. Holiday makers look at Japan's sailing boats 2,570 ton "Nihon maru" right and 2,256 tons "Kaiwo maru" as the vessels are moored at a port in Uraga, Yokosuka city, during the Yokosuka Tall Ship Parade 2007, the part of the festive events marking the city's 100 years anniversary Saturday, May 12, 2007. Japan's sailing boats, 110 meter long and 2,570 ton "Nihon maru", left, leads 52.2 meter long and 362 ton "Akogare", second from right, and 110 meter long and 2,256 ton "Kaiwo maru" off Yokosuka city, in Tokyo Bay during the Yokosuka Tall Ship Parade 2007, the part of the festive events marking the city's 100 year anniversary Saturday, May 12,. 2007.